Hey there friends, as you may know by now, I am a hooper! 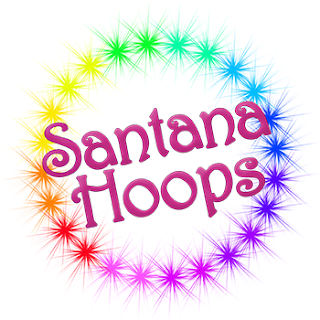 I love to use a hoop for exercise and recreation and LOVE to share the joys of the hoop. Because hooping has consumed a huge part of our lives, my mother and I started a hoop shop a few years back, Santana Hoops, We specialize in LED hoops and practice/performance hoops. However, we can make just about any custom taped hoop you can thing of. If you are interested in purchasing a hoop, I want to give all of my followers little discount on Etsy! If you enter the code polished in the coupon code box, there will be a %15 discount for my favorite lacqueristas!! But keep in mind, hooping really does a number on your long and pretty nails! But I promise you, hooping is worth it! The first few months of my hooping life I had itty bitty nails because they would break when I'd throw and catch the hoop. The hated me! You may even notice that if you look back on my archived posts about April - July of 2012. After some time I didn't feel so awkward with the hoop, so I have had much less chips and breaks. So don't let that stop you if you want to get into a circle.